We are a locally owned retail full line grocery store. We offer home delivery, carry-out, chicken broasting, deli. We are now a member of the SpartanNash brand. 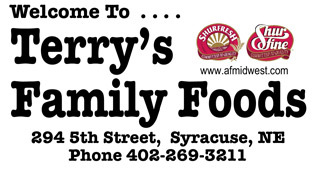 Our family advertisement is now inserted in the Penny Press every 2 weeks. Mon. thru Thu. 7:00 a.m. – 7:00 p.m.
Fri. 7:00 a.m. – 6:00 p.m. Sat. 7:00 a.m. – 5:00 p.m.